It was a call made by the family buds to go to the Circus. I knew that my 1st son watches advertisements in the TV and News paper, but he also started grabbing what is happening in the city. As the last four days was holiday due to weekend and Chinese New Year (working for Asia Pacific operations of a Pharma client) I decided to take them to the Circus. 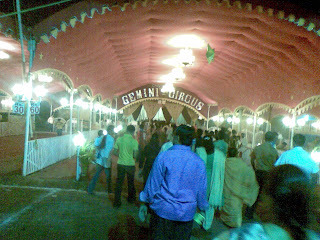 It is almost after two decades after my last visit to a circus, incidentally this is again to the same Gemini Circus whom I visited last. I remember my childhood seeing the sky where one can see the halogen focus light beam being flashed in the clouds from the circus tents to draw attention from the public. We used to go as a group lead by our teachers in the school. The main attraction in the circus was always the animals. As I my home town had no Zoological park, at that time circus is the only platform to witness the wildlife under human supervision. Though the recent legal notes are banning such animals in circus, still elephants, parrots and dogs are allowed to show off. I felt expect the ban on animals nothing changed, I told myself after seeing the tents and the sign boards Gemini Circus had near the venue. In fact, for my best I could even recognize few of the circus artist faces (believe me I told this to my wife in the event when I saw them). 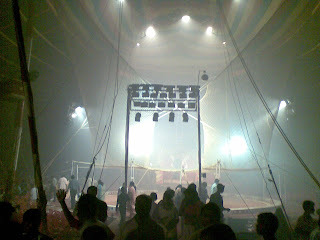 It was great feeling when entering to the circus tent; it was like entering into the past days in the time craft. Oh man… how fast I have grown to become older. The entire day was recalling me to the old days reminding all my childhood circus visits. The auditorium made on cloth tent also was amazing and reminds the same old model, nothing changed expect me. I was trying to capture those circus moment but even before my camera was put on, there was an announcement not to click pictures of the circus. Seasons Greetings! I hope every one had a party time during the festivals. I had fun filled holiday time celebrating Deepam, New Year and Pongal festivals. As the festivals brings holidays, I took at most privilege to use the festival to enjoy myself in the way I like. 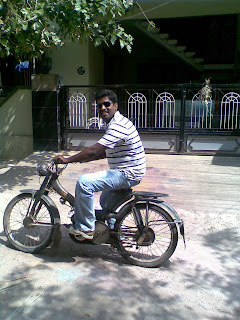 Had lots of time to start my Old moped, It was really chilling experience to drive the 30 years old moped on the road. It was not in starting condition initially and the holidays really came first hand help to do the mechanical service. 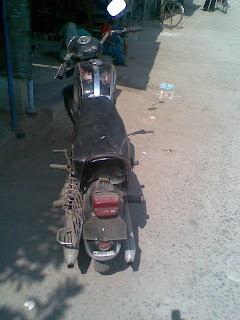 This moped is called “Suvega” and manufactured in India y India Mopeds limited. For those who don’t know what is pongal festival? It is a festival for harvesting formers in Tamilnadu. This is the most celebrated festival among Indians. As I’m being half former (? ), as matter of fact we did harvest the rice and celebrated the pongal festival in the farm fields. 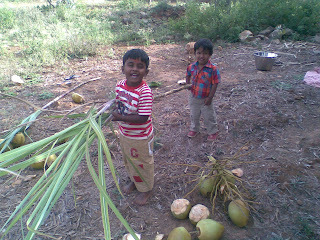 My juniors were enjoyed their time in the farm, here is the picture of them carrying sugar cane. One can never forget his school life, isn’t? I’m no exception, last week my elder son wanted me to show him the schools I studied during my childhood. What else I want; having a good reason to visit the schools, I geared up with in my Yamaha RX100 along with my son to the schools. I was really unforgettable half a day to spend in the recent past, I recalled nearly 12 years of my life in the span of few hours. The primary school below here is where I studied from 1st standard to 10th standard; it was called Danish Mission Hr. Sec. School. It was built around 110 years back by Denmark missionaries and the red building behind me is a land mark in my hometown. The colorful school here below is where I did my Higher Secondary level (+1 and +2 or 11 th and 12th Standards) schooling. Though it was a government school I really can’t forget the two years I studied in here, I thank to my son for giving me this opportunity to visit my schools after a long interval. With my Jeep friend and three jeeps, We have visited Jawadhu Hills for Off the Road trip. We met near Chengam where my farm is located and proceed to move towards the incline route of Jamunamaruthur from Paramananthal Village. We encountered to see a Haina just few foots from my Jeep, before I click any picture the creature escaped into the dark jungle. I'm sure my friends had nice time driving through the forest land, we had a water crossing sport entertained with the Jeep. Out of the three jeeps, my friend Utkarsh's jeep won the Jeep of the day title by flying on the air in one of the incline from the water front. I literelly seen the girl sitting in the rear seat fly on the air. 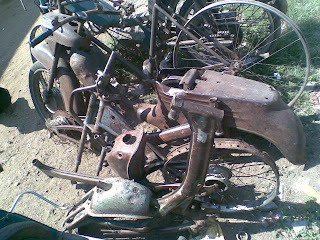 My old bike, never restored but still with original paint and drives well. Pictures of this bike for your eyes only. 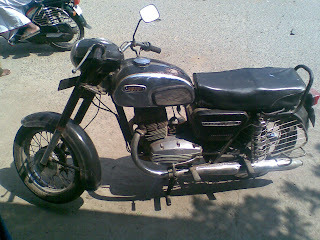 This is also from the JAWA line production and called Yezdi D250 Classic. I was keeping this bike in a concrete room for more than 3 years now and it has seen the sun yesterday after a long hibernation. Yeah, you got it right. 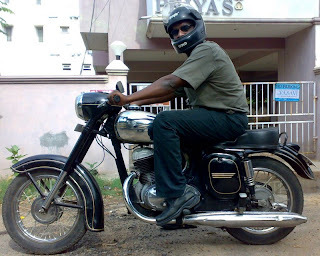 I drive the classic bike JAWA 250, it roars even after 35 years of it's birth, elder than my age. First I got admired to the dual thumb out of the twin silencers that came out from single cylinder, then fell in adamant to own one. I remember in my school days, one of my Physical Education master used to drive the JAWA bike which was iconic for the sound next to the Royal Enfield Standard bullet driven by my head master. 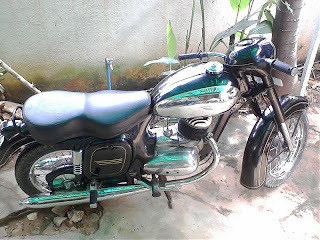 My dream was fulfilled only when I reached 30years of age, not that JAWA 250 affordability issue in fact they are economically cheaper to own but finding one in great shape is the issue. Also I was not keen in restoring this bike considering my previous experiences in restoring Jeeps and Yamaha Rd350, I know the pain involved in sourcing the parts. So, the decision of opting a fully restored genuine JAWA 250. 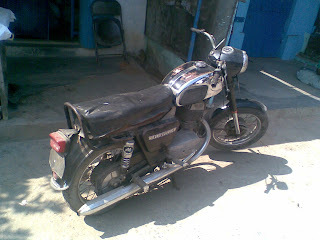 My search for this bike enlighten me of many yezdi model B bikes being faked and sold as JAWA 250. Luckily my little automobile knowledge helped me getting out of the fake market. 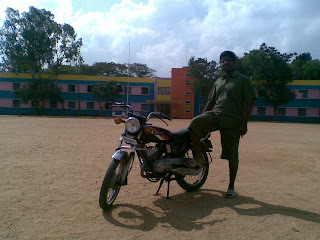 Early in the year 2008, I landed a photo album of Orkut site with a beautiful JAWA bike's picture posted in there. 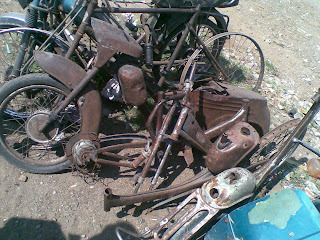 I did know that it was my future JAWA bike, as I set my goal to make that mine. 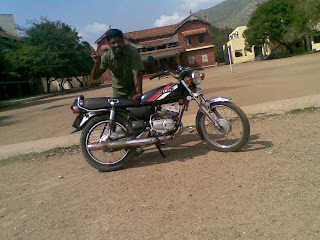 Today, that JAWA is standing on my Orkut album carrying ownership name as mine. 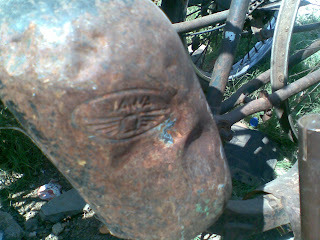 ;-) This bike is not part of my primary automobiles parked at my home and I drive it very often. This is my bike, I call it as "RIDER" ofcourse it roars well. 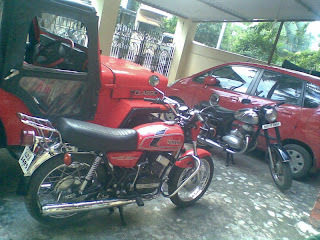 But the ""ROARING RIDER" is a name of our local JAWA/YEZDI club, it is a coinsident. Apart from my RIDER aka. 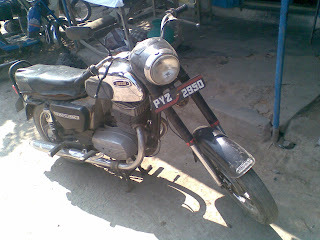 JAWA 250, I do own a Yezdi D250 Classic model. More information about the Yezdi also will feature in this blog.